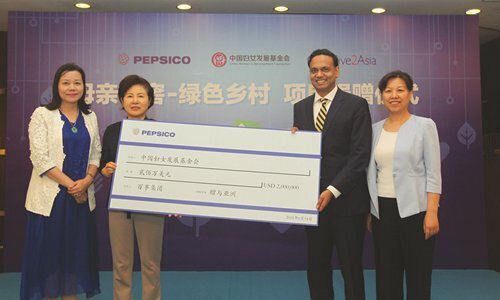 PepsiCo, Inc announced on June 14 a $2 million grant to China Women's Development Foundation (CWDF) to support its new initiative "Water Cellar for Mothers-Green Village" program. PepsiCo becomes the first Fortune 500 to support this new initiative. PepsiCo has been a significant donor to CWDF in recent years. The "Water Cellar for Mothers-Green Village" is an extension of the Water Cellar for Mothers project implemented by CWDF, which will carry out projects to improve quality and efficiency of drinking water in rural areas of China. It combines environmental health management, water source protection, women's empowerment and helps local residents improve their living environment and enhance their awareness of watershed conservation. PepsiCo and CWDF have selected the water resources along the mid-route of China's South-to-North Water Diversion Project as the project implementation area. To ensure a drinking water supply in North China, the large-scale trans-provincial water diversion project of China - the middle route of the South-to-North Water Diversion project - started to officially transfer water in December 2014. As the major water source, Danjiangkou Reservoir has attracted increasing attention due to environment protection issues near the reservoir and upstream areas. However, the local villages still lack a centralized waste disposal system, and the environment health of living conditions for many residents have yet to be improved. It is also important to enhance local residents' awareness of water source quality and environment protection. The program will be officially implemented starting from the fourth quarter of 2018 and is expected to continue for a period of eight years. Give2Asia, a non-profit organization, will administer the grant. This program is expected to build or renovate the centralized water supply facilities in the core project villages in Hubei, Henan and Shaanxi provinces, help 4,000 project residents build sanitary household lavatories and establish a rural garbage disposal system and mechanism. The project is expected to reach more than 10 million beneficiaries by the end of 2025. There are about four billion people globally who are affected by water scarcity, and by 2025, an estimated two-thirds of the world's population will be living in water-stressed regions as a result of current water use habits, population growth and the effects of climate change. According to statistics from the Chinese Ministry of Water Resources, China's per capita fresh water resources are only 28 percent of the world's average, making China one of the most water-deficient countries in the world. "The shortage of safe water access is an urgent challenge facing the whole world and it has been a key priority for PepsiCo," said Ram Krishnan, president and CEO of PepsiCo Greater China Region. "As a global corporate citizen fully embedded into the fabric of Chinese society, PepsiCo is committed to being truly 'In China, For China, with China.' We are honored to partner again with CWDF to actively seek out innovative and sustainable solutions for safe water access and environmental governance tailored to China. Together, we can meaningfully increase access to safe water in China and other countries around the world." Meng Xiaosi, President of CWDF said, "Over the past 10 years, with the non-stop support from PepsiCo and the great efforts from all walks of life, 'Water Cellar for Mothers' project has provided safe water access to 3.04 million people in the villages and schools in 25 provinces in western China. In the new era and new stage, we need to identify and resolve new problems of safe water access in rural areas by keeping pace with the times. PepsiCo, always our high-quality partner, has successfully carried out similar safe water access projects in many countries around the world and accumulated a wealth of experiences. We highly commend PepsiCo's long-term goals to support the public welfare. We hope that through the 'Water Cellar for Mothers-Green Village' program both sides can take lead in exploring sustainable solutions to problems of safe water access and environmental governance in rural areas of China." PepsiCo has supported CWDF's Water Celler for Mothers program since 2001, providing safe water access to disadvantaged areas in central and western China. PepsiCo is also the first Fortune 500 company to partner with the program, with contributions amounting to 55 million yuan ($89 million), having built more than 2,300 water cellars, funded new constructions of or upgraded more than 200 centralized small-scale water supply facilities. As of today, PepsiCo's contributions have benefited about 900,000 people in 10 provinces including Sichuan, Yunnan, Gansu, Guizhou, Qinghai and Shaanxi. As one of the first global food and beverage leaders to enter the China market, PepsiCo has always attached great importance and invested heavily to sustainable development. In October 2016, PepsiCo announced its "Performance with Purpose 2025 Agenda" designed to deliver top-tier financial performance over the long-term by integrating sustainability into its business strategy. PepsiCo commits to providing access to safe water to a total of 25 million people since 2006 in the world's most water-at-risk areas, with a focus on communities near where PepsiCo works, by 2025. Since 2006, PepsiCo has invested more than $40 million in the world in providing safe water access solutions and provided safe water access to 16 million people in the most water-stressed areas, realizing around 60 percent of its global goal.